What is next for your software testing career? There are some exciting new career options in testing, so read below how you can get that job you’ve always wanted. If you are looking for your first software testing job, getting your ISTQB Foundation Level Certification is an easy choice. It's the software testing certification standard, with hundreds of thousands of certified testers across more than 70 countries. Many employers expect their new testers to have ISTQB Foundation Level Certification. However, the real fun in software testing often takes place at the advanced and expert certification levels. That is because these certifications lead to more challenging projects, different types of testing, and even test management. Let‘s see how you can use these higher level certifications to get that testing job you’ve always wanted. 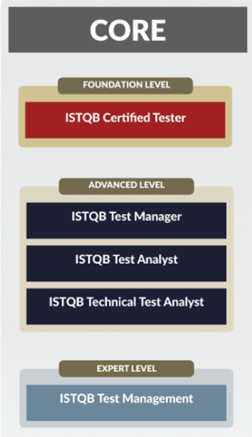 You probably know that ISTQB has long offered “core” Advanced Level certification options, such as Test Manager, Test Analyst, and Technical Test Analyst. At the Expert Level, ISTQB also offers the “core” certification of Test Management. They are highly respected in the testing community. They are well established but continue to grow rapidly. They provide three clear career paths, each of which can serve as a launch pad for many other career options. You can’t go wrong with a “core” Advanced and/or Expert Level ISTQB Certification. In fact, we recommend that you get at least one Advanced “core” certification, and perhaps even all three, along with at least one Expert “core” certification. What if you want to spice things up in your testing career? “Core” options are the “sensible” choices that everyone needs. But it’s fun to also have those unique testing skills that bring you special attention. If you want to try new things - and get extra attention - there are new “speciality” certification options that have testers excited. Test Automation: Test automation is hot, and it shows no sign of slowing down. While there are many great test automation tools, we all know that the tester is the real key to automation success. If you want to be your company’s leader in test automation, you’ll love ISTQB’s new Advanced Test Automation Engineer. The exam will be available in a few weeks, but you can already download the free syllabus (body of knowledge), sample exam questions, and sample exam answers. Security: Do you want to get the attention of top management? Then talk security. Hardly a week goes by without a new high profile security breach or attack vector. For years, management has thought of this as just an IT issue. Management now know better: good software code is critical to security. Earning ISTQB’s new Advanced Security Tester Certification could bring you instant attention in your organization. Mobile: If you’ve seen your company’s analytics reports, you know how important mobile is. 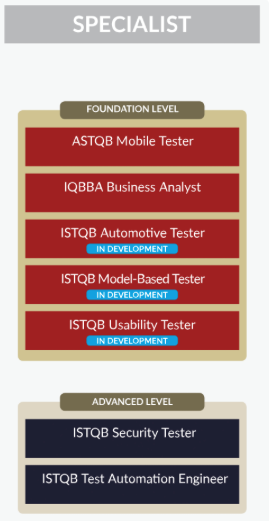 In fact, it’s really hard to overstate the importance of ASTQB’s Certified Mobile Tester for most testers’ careers. From Google’s massive emphasis on mobile to the sheer growth of phones, tablets, and watches, mobile is all-important, and Certified Mobile Tester is critical to your career success. Business Analyst: Are you a tester who is involved in analyzing business processes within an organization, modeling businesses and process improvement? Then the IQBBA Business Analyst certification is the perfect addition to your credentials. Testers with business analysis knowledge are in demand, so IQBBA business analyst certification can give you a competitive advantage. They show you have a strong commitment to the testing profession and self-improvement. They demonstrate you have advanced/expert software testing skills. They prove you have the desire to move higher in your career and your organization. Pretend you are the boss trying to fill an advanced or specialty skills testing position. If there were two otherwise-equal candidates vying for the same job, but only one had related level certification, who would you choose? Ready for that next job? What do you do? If you already know what you want to pursue in testing, you can get started by downloading the free syllabi, along with free sample exam questions and answers. Read the story from a previous ASTQB newsletter issue about a software tester who obtained their advanced certification. It’s a great story from someone who understands procrastination, panic ... and success! ASTQB Director Taz Daughtrey recently published an article entitled "Securing the Internet of Things" in the CIP [Critical Infrastructure Protection] Report. The article was included in the latest issue of this report from the Center for Critical Infrastructure Protection and Homeland Security at George Mason University. Daughtrey assisted ASTQB Director Randy Rice in developing the syllabus for the ISTQB Advanced Level Security Tester. It is available for download on the ASTQB website. Distributed Denial of Service (DDoS) attacks are discussed among other potential threats in the syllabus, as is the concept that such attacks could originate from a “botnet” or robotic network of hijacked devices. What no one foresaw until it first happened on September 20, 2016, was that a cyber weapon could be crafted from interconnected video surveillance cameras, digital video recorders, and a variety of networking devices and home appliances (“Internet of Things”). The security professional is constantly challenged by this incessant exploration for new vulnerabilities and the means to exploit them. The security tester must be equipped to monitor and respond to emerging threats. Learn more about ISTQB Advanced Level Security Tester Certification by downloading the free syllabus and sample exam questions and answers. Attention software testing students (and their parents! ): It’s time to start thinking about applying for scholarships. If you are a student, a parent, or an educator, see our updated list of scholarships for those studying software testing, quality and engineering in the ASTQB Career Center. Have you ever wondered if your co-workers or contractors are ISTQB Certified? As the official board for ISTQB Certification in the United States, ASTQB offers a searchable database of those who have been certified via ASTQB. Search the official database of the U.S. Board, ASTQB, right now. Please make your opinion known by participating in this 10-minute survey (around 20 questions) from ISTQB. The purpose of the survey is to get more insight what you see as the current trends, and how that relates to the current ISTQB certification portfolio and its further development. We appreciate your assistance in shaping the future of software testing. Feel free to share this link with other software testing colleagues. As the official ISTQB Board for the United States, ASTQB creates superior quality ISTQB exams. Not only are the ASTQB-created exams vetted for overall quality, but they are specifically written for the American-English audience. ISTQB exams from other countries or exam providers, even if they are in English, may be written in a way that doesn't make sense to you, making the exam more difficult than it should be. The ASTQB exam is the only American English exam, with terms and examples that are relevant to those who are in the U.S. or are hoping to work in the U.S.
Now ASTQB has also created special sample exams that reflect the uniquely high quality of exams that we have created for the U.S. audience. You can find them in the ASTQB library – just look for the sample exams with the special note about their high quality. As you can see, taking your ISTQB exam from ASTQB makes for the best possible exam experience. As a bonus, being certified through ASTQB also gives you extra benefits such as the ASTQB Career Center, priority for live ASTQB webinars, local group sponsorship opportunities, and other exclusive ASTQB-only benefits. Learn more at the ASTQB website. Q: What does being an “ASTQB Accredited Course Provider” mean, and why should I choose one? A: Watch out: not all software testing training companies and courses are of equal quality. Accreditation by ASTQB ensures that if you take a course from an ASTQB Accredited company, you will have a reasonable chance to pass the exam. That’s because ASTQB reviews the course for its coverage of the certification syllabus. In addition, ASTQB requires that courses be taught by an ISTQB Certified Tester. Other factors, such as experience in training of software professionals and experience in testing, the provision of adequate facilities, and documentation of quality assurance procedures within the applicant’s company, also influence the ASTQB’s decision on accreditation. You can find the ASTQB Accredited training providers on the ASTQB website. Also look for special offers below. ALPI: Save 20% when you register for one or both of our ISTQB Advanced Level training classes in December using code ADVFORME: ISTQB Advanced Level Test Analyst, Dec. 19-22 and/or ISTQB Advanced Level Test Manager, Dec. 12-16. Both are virtual, live courses that you can take from your home or office. Register now at http://www.alpi.com. Expires Dec. 22, 2016. Rice Consulting Services: Rice Consulting Services is offering a 10% discount on individual registrations for the online study group or e-Learning course (beta version) for the new ISTQB Advanced Security Tester certification. Use Promo code ISTQBSEC1. Register 3 or more people and get an additional 5% discount. Use promo code ISTQBSEC2. This offer expires on December 15, 2016. For details, visit http://mysoftwaretesting.com. RBCS: As a show of our gratitude towards our clients and the testing community, RBCS is extending a limited time offer for a 20% discount off of all products in the RBCS Marketplace.The discount applies to everything, including live training, virtual classes, enterprise licenses, books, ISTQB exam prep guides and e-learning! Visit RBCS Marketplace and enter the code GIVETHANKS16 into the discount code field in your cart to receive the discount! No minimum order. Cannot be combined with other discounts. Offer expires November 30, 2016. SQE Training: Pay it Forward >> Continue your journey along the ISTQB certification path with special savings on accredited Agile Tester Extension and Advanced Level Certification courses from SQE Training. Save 16% on the cost of training for any 2016 or 2017 public certification class purchased by December 31, 2016, with promo code 16FWD. Restrictions apply; learn more. As always, we welcome your feedback and criticism. Let us know what we can do to help make you and your company better at software testing at info@astqb.org. Non-profit, non-commercial publications and Web sites may reprint or link to articles if full credit is given. Publication, product, and company names may be registered trademarks of their companies.